I’d like to add another recipe to this list: hummus. If you’ve just set out on the plastic-free and zero-waste path, and you love hummus, mostly likely you’ll have to make it. Where I live, grocery stores carry hummus only in plastic tubs. Fortunately, you can whip up a batch in minutes (after you’ve cooked the chickpeas…). Simply whir your ingredients in a food processor and slowly add olive oil. Voilà. Plastic-free hummus. Soak overnight and cook in a pressure cooker for about three minutes. If you cook extra chickpeas you can freeze them either with or without liquid in glass jars to use later. 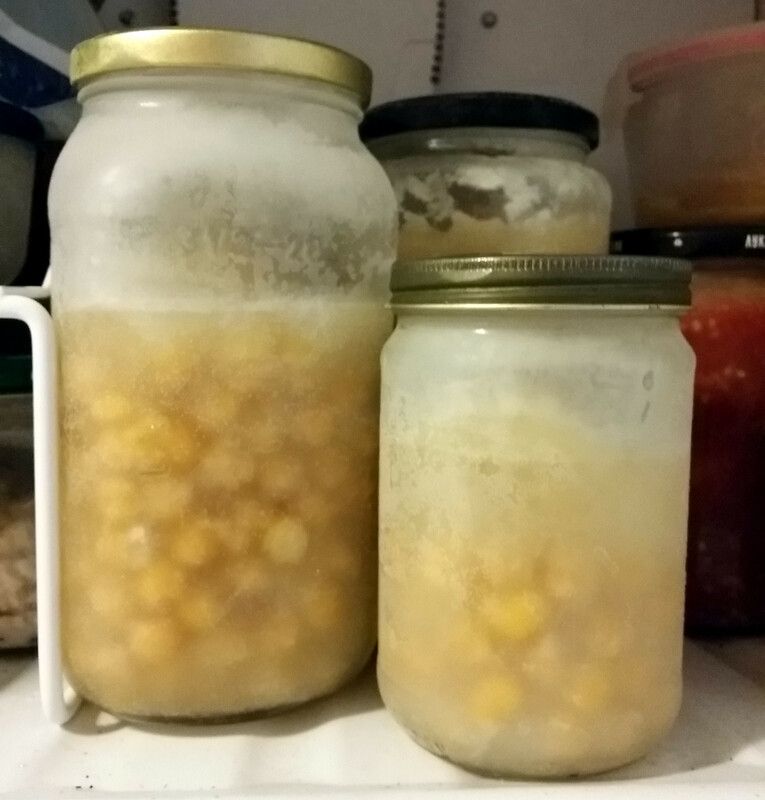 To thaw, just transfer the jars of frozen beans to the refrigerator the night before you plan on using them. 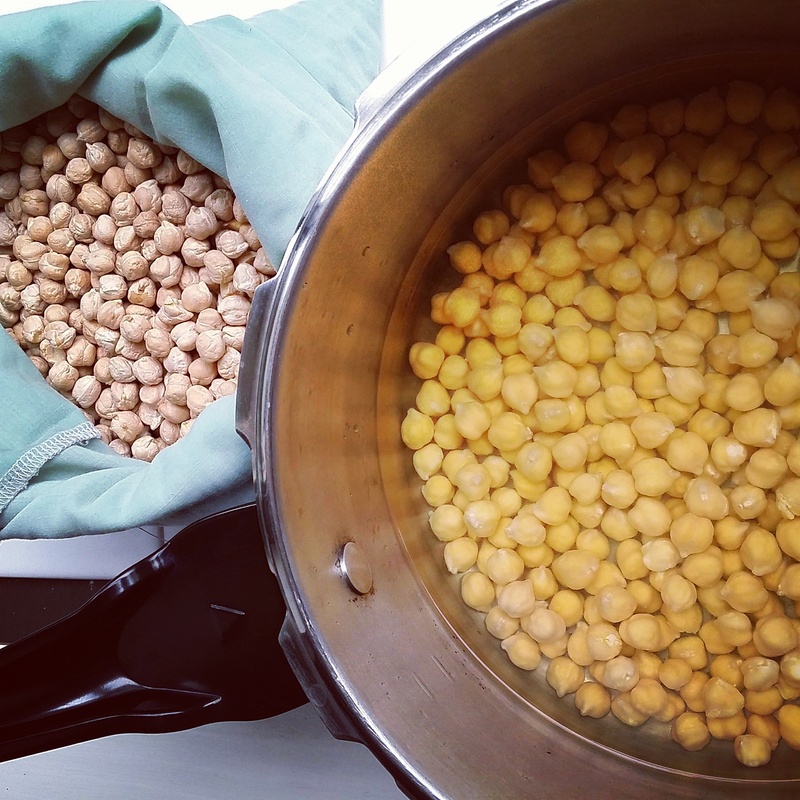 For this post, I used previously frozen chickpeas just to prove that it can be done. The hummus I made has a creamy texture and tastes delicious—no freezer funk. Yes you can freeze food in glass jars. Leave an inch or two of headspace. I’m able to buy chickpeas and even tahini in bulk. The lemons come from my yard. I buy olive oil either in bulk in glass jars I bring to the store or my boss picks up a half-gallon jug of it for me when she visits Napa. I reuse the jugs for brewing kombucha or ginger beer. They cost several dollars new at a wine and beer brewing shop. Update 08/15/17: Here’s a recipe for homemade tahini. It’s very easy to make. 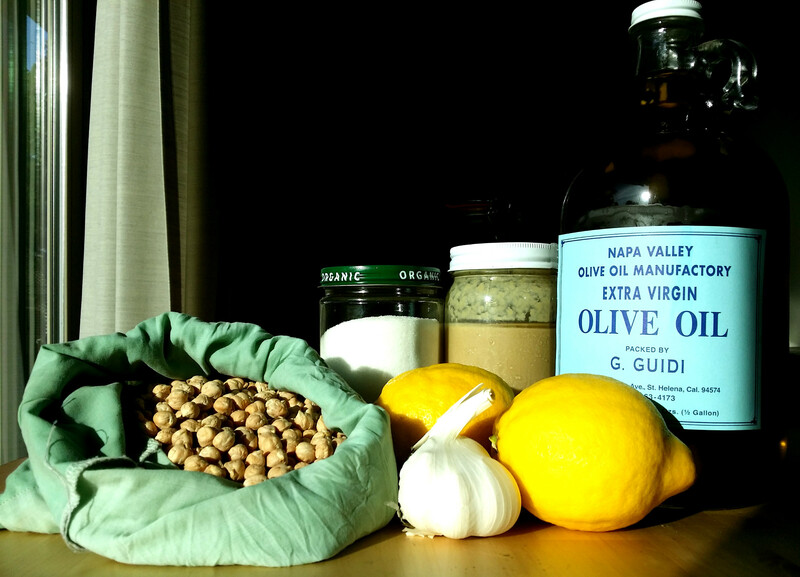 My daughter created this recipe several years ago for her blog, The Plastic-Free Chef. It goes well with sourdough crackers. Enjoy! Add the chickpeas, tahini, lemon juice, salt and garlic to a food processor. Process until smooth. While the food processor is running, slowly pour in the olive oil. Process until all the oil is completely mixed in. This is really awesome and I’m excited to integrate your ideas into my hummus making! But one thing that has always worried me about some zero waste cooking – such as simmering stock or cooking chickpees on the stove for several hours — does that use a lot of gas, possibly negating the effects of reducing packaging? A pressure cooker is the answer. I love mine. It cooks soaked beans in mere minutes. I got mine second-hand to boot! Thanks so much! I’m not very “anchored” at the moment and so can’t accumulate too many appliances – but maybe at some point in the future I’ll nab a pressure cooker second hand. I’ll try to find an alternative way to make hummus in the meantime! sprouting the chickpeas also cuts down on cooking time. I’m excited to try this, thanks for the non-intimidating recipe! Great post and I checked out your daughters blog too. This is the direction I’m heading and love all this information. Thank you! I’ll tell my daughter. Maybe she will start to write again 😉 I’m glad you find the information helpful. 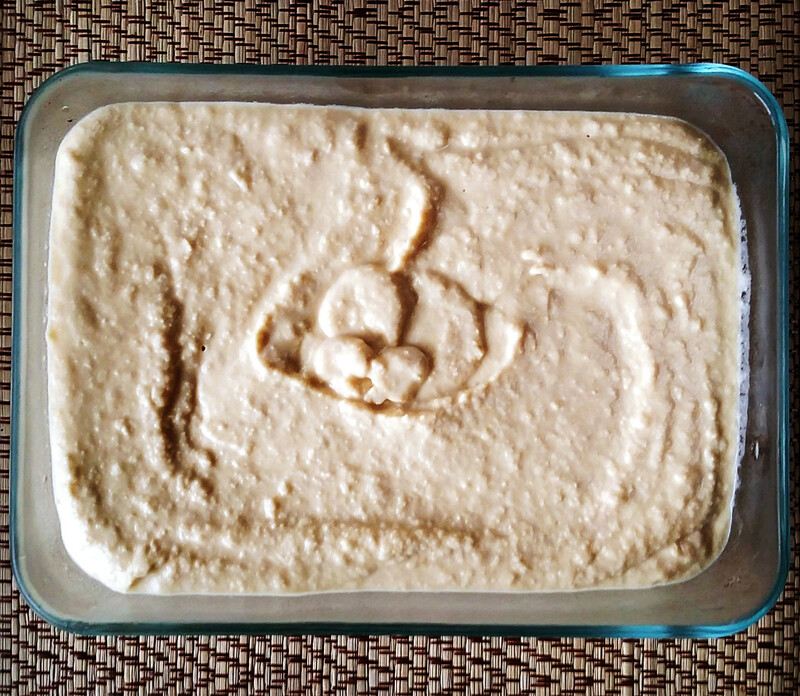 I love hummus and started making it on my own a while back, too. I also love your chocolate syrup recipe, by the way. I have a jar of it in my fridge right now, mostly for hot chocolate. It’s such a delicious, nutritious and healthy staple. Glad you like the chocolate syrup. My younger daughter likes that too. I will try this recipe. I love hummus and do make it, but I always make way, way too much because I never could figure out how many dried garbanzo beans to use. This looks simple and will make the right amount for our two person family. Thanks! In our area, we don’t have access to Tahini in bulk. So now it is also on my list of easy to make and not having to buy. I also have simply substituted it before by adding sesame seeds and oil directly with the chick peas for hummus, and in a pinch, I have tried using sunflower seeds, and it turned out great. Thanks for your inspiring posts! Thanks for the ideas. I would like to make my own tahini. The fewer products I need the buy, the better! Can I also used canned chickpeas? Hi Anne-Marie, I have discovered your blog a couple of months ago and I really love it. I am trying to reduce as much as possible plastic and found so many tips – I know I haven’t discovered all yet and I am very exiting to learn more. Back to the Hummus, How long do you think I can keep it refrigerated? A week or less?